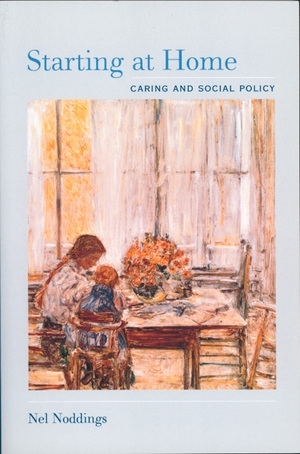 Nel Noddings, one of the central figures in the contemporary discussion of ethics and moral education, argues that caring--a way of life learned at home--can be extended into a theory that guides social policy. Tackling issues such as capital punishment, drug treatment, homelessness, mental illness, and abortion, Noddings inverts traditional philosophical priorities to show how an ethic of care can have profound and compelling implications for social and political thought. Instead of beginning with an ideal state and then describing a role for home and family, this book starts with an ideal home and asks how what is learned there may be extended to the larger social domain. Noddings examines the tension between freedom and equality that characterized liberal thought in the twentieth century and finds that--for all its strengths--liberalism is still inadequate as social policy. She suggests instead that an attitude of attentive love in the home induces a corresponding responsiveness that can serve as a foundation for social policy. With her characteristic sensitivity to the individual and to the vulnerable in society, the author concludes that any corrective practice that does more harm than the behavior it is aimed at correcting should be abandoned. This suggests an end to the disastrous war on drugs. In addition, Noddings states that the caring professions that deal with the homeless should be guided by flexible policies that allow practitioners to respond adequately to the needs of very different clients. She recommends that the school curriculum should include serious preparation for home life as well as for professional and civic life. Emphasizing the importance of improving life in everyday homes and the possible role social policy might play in this improvement, Starting at Home highlights the inextricable link between the development of care in individual lives and any discussion of moral life and social policy. Nel Noddings is Lee Jacks Professor of Education, Emerita, at Stanford University. She is the author of Caring (California, 1984), Women and Evil (California, 1989), The Challenge to Care in Schools (1992), Educating for Intelligent Belief or Unbelief (1993), and Philosophy of Education (1995).